Apply for Ag Literacy Grants Today! 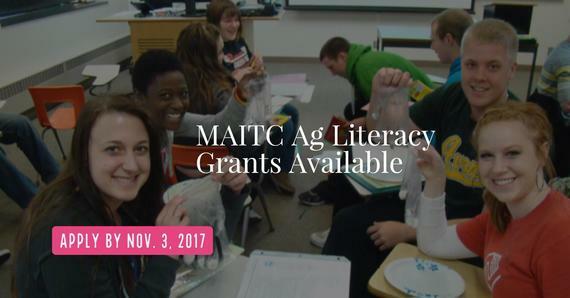 The Minnesota Agriculture in the Classroom (MAITC) Foundation is excited to offer grants to K-12 teachers, as well as 4-H and FFA groups! Applicants are encouraged to be creative and develop interesting, valuable agricultural experiences for their students that address multiple curricular areas. New this year - First Year Teacher Grants! We know that first-year teachers face many exciting opportunities and challenges. 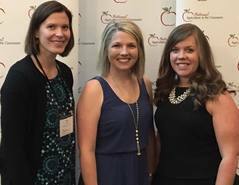 To provide assistance and encouragement to new teachers, the MAITC Foundation is offering ten, $250 grants to be awarded to first year teachers to integrate agriculture into their curriculum and classroom. Applications are due November 3, 2017. One MAITC Outstanding Teacher Award will be given to an educator currently engaged in classroom instruction at the K-12 grade levels. This award will recognize the teacher for his/her creative efforts to teach students about the importance of agriculture. The winning Minnesota teacher will receive $500 and have up to $1,500 of his/her related expenses paid to attend the National Agriculture in the Classroom Conference June 26-28, 2018 in Portland, Maine. Applications are due November 3, 2107. MAITC is excited to be part of the MEA Conference at St. Paul's RiverCentre on October 19th. Stop by booth 216 in the exhibit hall form 7:30 AM - 3 PM. Also, join our workshop from 2:50-3:50 PM for hands-on experience with ag-focused lessons and activities. We'll also investigate the new AgCultures project from the U of M's Learning Technologies Media Lab. Tune in for another MAITC Facebook Live Virtual Field Trip! 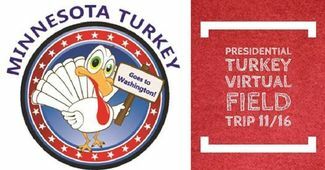 We will visit the Wittenburg Turkey Farm near Alexandria, MN. This farm is home to the 2017 Presidential Turkey Flock. Find out what goes into raising and preparing the Presidential Turkeys for their expected White House visit. The virtual field trip will be broadcast through the Minnesota Agriculture in the Classroom Facebook page at 10am CST on November 16th. Teachers, tune in with your classrooms and ask the turkey farmer questions live! The MAITC Foundation recently hired two Regional Ag Literacy Specialists. We are extremely excited to welcome Toni Daulwalter and Wanda Patsche to our MAITC team. Toni will be geographically focused in Carver County and Wanda in Martin County. They join Rachel Gray (Regional Ag Literacy Specialist in Bemidji area) and Education Specialists Keri Sidle and Sue Knott in working to empower K-12 teachers to integrate agriculture into science, social studies, language arts, math and nutrition curricula. Who will be responsible for managing the resources to sustainably feed 9 billion people by 2050? If this question isn’t enough to engage your secondary students (who will be part of the solution) consider tuning into this web seminar on Thursday, October 26, 2017, from 5:30-7:00 pm CST, to engage your students experientially with the three dimensions of science learning through the context of agriculture! It's harvest season! Corn is a very important Minnesota crop being harvested by farmers. What is the scientific name (Genus species) for corn? Send answers to sue.knott@state.mn.us .